Convening a workshop for a group? Click here. Juxtapose fibre art with natural materials to create a framed, stitched, three-dimensional textile assemblage. Allow the rich textures, brilliant colours and nuanced lines of stitched textiles to interact with the mysterious beauty of the imprinted stone, the gentle branch or a fragile leaf. Incorporate fabric transfers of precious photos, and tell a story with the remnants of an heirloom quilt. Create an evocative and exciting composition that combines the work of our hands with that of Mother Nature's. Work with a variety of textiles, including remnants of our own stitched, embroidered and embellished work, new fabrics, and found pieces of textiles that catch your eye. 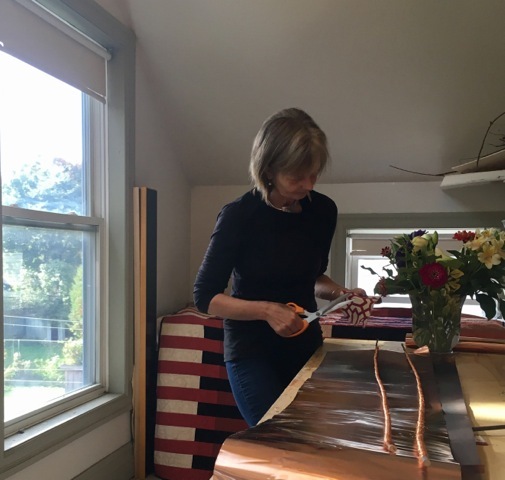 Alice Vander Vennen has been presenting studio workshops in private settings, for guilds and community groups, and at art festivals for over ten years, and has been a professional educator since 1980. Alice cultivates a supportive environment for exploring new techniques and pushing creative boundaries, for both experienced artists and beginners. Workshops are available to fit the needs of each group, and run from one to four days in length. Create an evocative and exciting composition that combines the work of our hands with that of Mother Nature’s. Allow the rich texture, brilliant colours and nuanced lines of stitched textiles to interact with the ancient beauty of an imprinted stone, the bending branch, and fragile leaf. The finished art piece created from these treasures found through exploration or everyday encounters, is subtle and compelling as a new narrative emerges. We will begin the process of creating an assemblage with cutting, positioning, juxtaposing the variety of elements into a composition that speaks of a new narrative. We will combine and “quilt” the composition, allowing the elements of nature to become a part of the story. The finished piece will be framed and ready to go. The finder who becomes the keeper now becomes the quilter. Create mixed media assemblages that juxtapose the most unlikely elements. Textiles form the starting point, and then it is fair play, stitching together copper and cloth, button and branches, or knobs and nails. This juxtaposition is obviously not for any guest-room bed. Instead it becomes a surprising and compelling piece of mixed media art. Surprise yourself with possibilities by creating art that is both personal and mysterious, art that speaks of roads travelled and stories found, art that becomes the keeper of stories. We will begin the process of creating an assemblage with cutting, positioning, juxtaposing the variety of elements into a composition that speaks of a new narrative. We will combine and “quilt” the composition, allowing the found objects to become a part of the new narrative. We will frame the art work in shadow box frames. Join me for a workshop where we will focus our creative energy on creating an art piece using textiles and objects that carry memory and meaning. The age-old process of quilting will be joined with the new technique of photo transfer, and instruction will be given on incorporating your own meaningful historical images and materials into your own finished art piece. Participants are encouraged to bring photos and letters which can be photocopied and have the image transferred onto fabric. 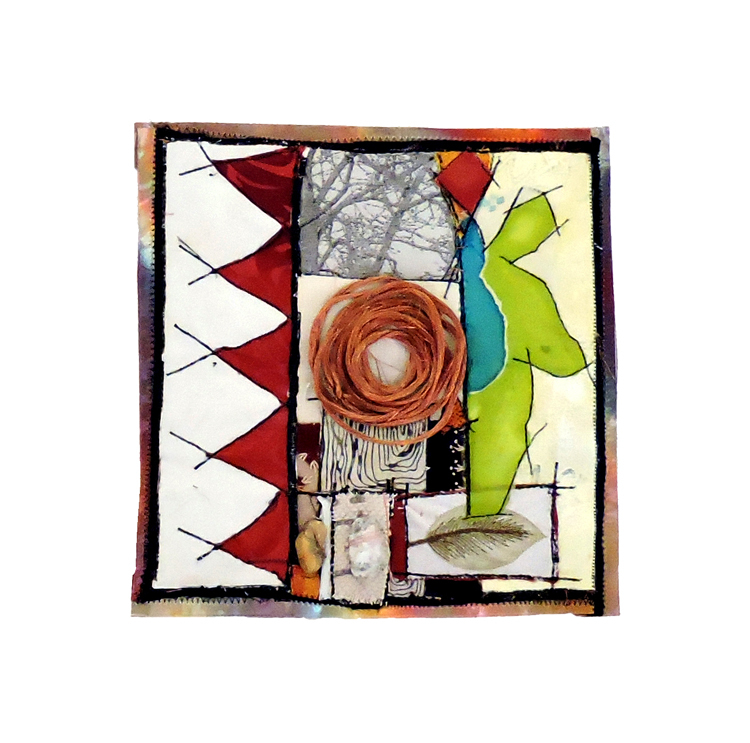 These images can then be juxtaposed and quilted with textiles, fabrics and found objects to create a new piece of art. Because of the juxtaposing of the materials, the finished piece becomes a unique and compelling piece of art. The materials—textiles, either hand-embellished or new, natural materials, such as sticks, stones, feathers and leaves, and found objects, such as buttons, scraps of metal—all carry their own history and are imprinted with their own unique story. Quilting all of these stories together creates a new visual voice. Enjoy the luxury of learning, exploring, and creating over a four-day long course. With four days set aside for immersive creative play, dive into experimenting with juxtaposing found objects, photo transfer and beauty from nature. Juxtapose fibre art with natural materials to create a framed, stitched, three-dimensional textile assemblage. Allow the rich textures, brilliant colours and nuanced lines of stitched textiles to interact with the mysterious beauty of the imprinted stone, the gentle branch or a fragile leaf. Incorporate fabric transfers of precious photos, and tell a story with the remnants of an heirloom quilt. Create an evocative and exciting composition that combines the work of our hands with that of Mother Nature’s. Work with a variety of textiles, including remnants of our own stitched, embroidered and embellished work, new fabrics, and found pieces of textiles that catch your eye. The finder who becomes the keeper now becomes the creator. In this fun workshop, which plays around with combining the most unlikely elements, found objects become part of a larger story. While textiles form the starting point, it’s fair play from there. We’ll wrap a length of wood (roughly the same size as a cut-off hockey stick) with fabrics, and then we’ll add copper wire. When that’s done, we’ll mount on to this a random collection of things; it could be things that have meaning or that simply caught our attention, that look neat and interesting such as a stone or an old key. We’ll keeping adding to the piece, collaging and composing until the stick is totally covered in playful and thoughtful colour patterns. This juxtaposition of textile, wire, and things you find, is obviously not your everyday, high-tech memory stick. Instead it becomes a surprising and compelling piece of art that is uniquely yours. Create something beautiful and sculptural, by simply wrapping a piece of wood in all your favourite colours. From there, you can create as many as you want — what might happen if you created a whole mural of memory sticks, or a tall tower that could touch the ceiling? Surprise yourself with the possibility of creating a piece of art that is both personal and mysterious, one that speaks of roads travelled and stories found, one that becomes the keeper of memories. Making art is motion — it’s a process, starting with one thing leads to another. In the work that I do, using old images, textiles, found objects and traditional media, I find myself wandering, roving along lines that combine in unexpected ways to tell a new story. While the title of this talk may sound as though there is a map one can follow to find the stories, there is actually a fascinating randomness to it all, the undocumented, unstoried materials and histories filling a space and being assigned meaning. I hope you’ll come travel with me as we leave the map behind and do some creative wandering together, finding the stories. Note: this presentation is available with PowerPoint image slideshow accompaniment, which requires the venue to provide a screen and projector.